Kimberly Clark Is Running Out of Room to Grow…What's Next? Its products aren't selling as well as they used to, so the consumer products giant is shifting strategies in 2018. It's a mature consumer products giant, so investors' growth expectations for Kimberly Clark (NYSE:KMB) are understandably modest. The owner of the Kleenex tissue and Huggies diaper brands aims to expand annual sales at just above global rates. Those slight gains are usually boosted by an efficient operation that, together with healthy dividend payments, deliver market-beating overall shareholder returns. That simple formula has broken down over the last two years, though, as sales growth hit a wall. Let's take a closer look at what went wrong for Kimberly Clark, and how the company plans to get back on track. Organic growth was flat in 2017 as a 1% uptick in sales volume was swamped by a similar pricing decline. That was a disappointing result for two key reasons. For one, it marked the second straight year of decelerating growth for Kimberly Clark. Sales rose 2% in the prior year and expanded by a healthy 5% in 2015. Second, the flat result contrasts with stronger gains by its peers. 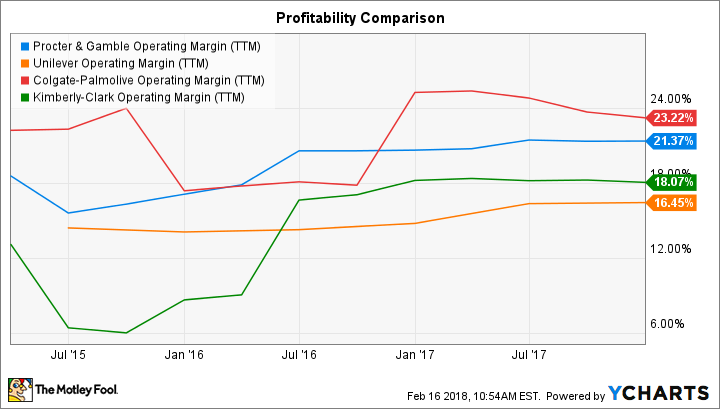 Colgate Palmolive grew by 3% last year, and Procter & Gamble (NYSE:PG) managed a 2% uptick too, even if that result translated into another year of falling market share for the consumer products titan. Yet given its weaker volume and pricing numbers, it's likely Kimberly Clark gave up share both to P&G and to other global and local competitors. The good news is that Kimberly Clark still managed to expand its profits last year despite major headwinds that included rising commodity costs, a sluggish global sales environment, and aggressive price cutting by rivals. Its efficiency program yielded $450 million of savings, which allowed adjusted earnings to rose 3% even though gross margin ticked lower and sales didn't budge. CEO Thomas Falk and his executive team are doubling down on that cost-cutting strategy for the year ahead. In fact, they announced a new restructuring plan in late January that includes laying off as many as 5,500 employees while closing or selling about a dozen manufacturing plants. Kimberly Clark is divesting many of its smaller, lower margin brands, too, all in service of improving profitability. "We know we need to grow our profit and earnings to deliver attractive shareholder returns," Falk recently told investors, "even in slow-growth conditions." Overall, the plan looks like a watered-down version of the transformation strategy that Procter & Gamble launched in 2014. That shift ended up removing 100 brands from P&G's portfolio while dramatically reducing its cost infrastructure. It hasn't yet returned the company to market share growth, though. Meanwhile, those tough industry conditions aren't expected to improve any time soon. Executives project that sales will rise by just around 1% in 2018 to again trail rivals including P&G, Colgate Palmolive, and Unilever. While investors are bracing for another year of weak sales, their overall returns should look similar to higher-growth years in the past. Executives believe profits will expand by between 3% and 5% in 2018 even as commodity prices remove as much as $400 million from earnings. The reduced cost profile means Kimberly Clark can keep profits and dividends marching higher. More importantly, it will allow the company to invest over $1 billion back into the business this year. Shareholders have to hope that this spending, which is focused on supporting innovative product launches in the Huggies, Depend, and Kleenex franchises, returns the company to a more robust sales growth pace following what's set to be Kimberly Clark's third straight year of volume and pricing challenges.